Operators: Durandin V., Troshkin V. P., Cherkasov S.
The film # 6 from the series "Chronicle of the Baikal-Amur Mainline (a railway line in Russia). About the BAM constructors, their problems. Construction of the Baikal tunnel. The explosion of births of children at BAM. Problems with your children in kindergarten, the construction of residential buildings - development zone BAM. Working group at the tunnel with BAM Ulitin son Kirill go through the woods to the cemetery, standing at the grave - LS., MS. Hands lay a wreath on the grave - CU. Photo Ulitina wife, who died in a car crash - CU. Brigadier Hero of Socialist Labor Lakomov Victor and his team at work - MS. Passing tracklayers with the NDP "Give Dawan!» - MS. The welcoming ceremony of the first train on the give, there are people - MS. Among the greeters foreman drifters VR Tolstoukhov, graduates of the Institute of Culture Lyudmila and Sergei Davydov with a child, the head of the Buryat construction site, Hero of Socialist Labor FV No Comments, an obstetrician-gynecologist AG Ponomarev (winter). VR Tolstoukhov at work (summer) - MS.
Davydov family - MS. (Autumn). FV Khodakovsky in the office, in the car - talking to members of the Komsomol, riding at BAM - MS.
AN Ponomarev removes the mask, talking to a man maternity - different. (Summer). Passing trains (winter) - LS., PNRM. Are met (Buryats) with "bread and salt» - MS.
Rally - LS., MS., Departure. Cut the ribbon - MS., PNRM. Present at the meeting Secretary of Party Committee of Buryat A.U Modogoev. FV stands No Comments (synchronous) - MS.
Read the cameramen - LS. Brigade drifters VR Tolstoukhov at work in the tunnel of the Baikal - different. The workers go in the tunnel on the water - MS. Breed on the conveyor - MS., PNRM. Drilling equipment - LS., Check-out (with a / t). Builders laying explosives - MS. The hand presses the button - CU. Meeting team Tolstoukhova: VR stands Tolstoukhov, workers say (all simultaneously). Sit workers in hard hats - MS. Continuation of the brigade Tolstoukhova (synchronous) - Various. Team at work - different. Passing cars, carrying rocks - MS., LS. VR Tolstoukhov passes on the street of the village (autumn), at home - washes, dines with his wife Valentina (teacher) - MS., LS. 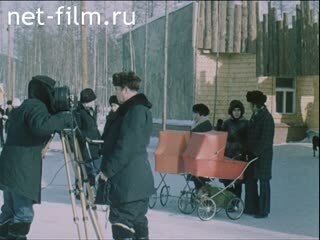 Tolstoukhov children: son Jack (builder) says at the table, the daughter of Lena (schoolgirl) takes the book - MS.
VR Tolstoukhov talks about life in the BAM (synchronous) - MS.
VR Tolstoukhov with his wife and daughter on a ski trip - LS. Holiday "Seeing Russian Winter" is the people, a man climbs a pole - LS., MS.
VR Tolstoukhov with her daughter on a holiday - LS. Tolstoukhov family in the woods, mushrooms, berries - MS., LS. Berries piled in a basket - MS.
Lake Baikal - LS., PNRM. Passing trucks - LS., PNRM. Bulldozer rolls rock into the lake - MS., PNRM. Farm chairman said about the dangerous consequences for the nature of construction (synchronous) - CU. Explosions in the forest - LS. Bucket takes breed - MS., PNRM., LS. Machine unloads the ground - MS.
Lake Baikal, the forest on the shore - LS. Doctor AG Ponomarev is Nizhneangarsk aerodrome is appropriate to the helicopter - LS., PNRM., MS., Hitting. AG Ponomarev talking with a woman in her yard - LS. Maternity Hospital, are children - MS., CU. AG Ponomarev talks about his work (synchronous) - CU. Newborn opens his eyes - CU. Women with strollers pass through the village - LS., MS. (Autumn). Children playing in the street - MS., PNRM. Pass fathers with children - MS., PNRM. Entrance to the nursery (or nursery) - MS.
Ulitin goes with his son - LS., PNRM. Passing teenagers on bicycles - MS. Passing cars - LS., MS., Hitting. People go, trees swaying in the wind - MS.
Holiday in kindergarten: Kindergarten employee hung paper figures hanging slogan "Welcome!» - MS., PNRM. Children in fancy dress, sing, dance, watch, play - different. Sing the head of the kindergarten and the employee (synchronous) - MS.
Ulitin home, playing with his son Cyril in cubes - MS., CU. 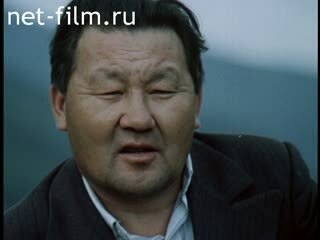 Cyril with his father in a boat at Lake Baikal - MS., LS. Icons dedicated BAM - CU. ; Cyril looks icons - CU. B. Treshkin interviews head of the kindergarten Sparks Nikolaevna, she says (synchronously) - MS.
Construction of a two-story Children's Services, working bulldozer - LS. Parents build a temporary kindergarten - MS., Departure. Along the street are people, a woman with a stroller - LS., Departure. Moving to a new home, people carry things - MS.
People talking on the street, among them AG Ponomarev - MS., PNRM., LS. Artist lecture (synchronous) and demonstrates reproductions, listen to women - different. Art Gallery in Severobaikalsk - MS.
Family Davydov, Ulitin with son watching pictures - MS.
Landscape of Siberia, traveling machine - LS. Passing trucks, special vehicles - MS., LS. Are construction workers - MS., PNRM. Driven car - MS., Departure. Machine hard drive through the blurred road (summer) - LS., MS. Car ride, burning lights - LS., MS. (Winter). Chauffeur car repairs - different. Talking drivers parked cars - MS., LS. Obelisk was erected in honor of the drivers and other bamovtsev killed in accidents - MS., LS., PNRM. The train passes by the Obelisk - LS. FV Khodakovsky talking on the street with the construction manager (synchronous) - MS., LS. (Winter). Construction of a bridge over the river Tayuru; FW No Comments on construction - MS., LS. City Severobaikalsk houses - LS., PNRM. with a / t (summer). Construction of residential buildings - LS., MS. (Winter). Construction of sewage treatment plants - LS., PNRM. Empty apartment - MS., PNRM. Port - LS., PNRM. (Summer). Product discharge and other goods - LS., MS.
Report on the settlement, people go - LS. (Winter). Women talk about the problems of supply in the BAM (synchronous) - CU. Meeting on the supply, says FW No Comments (synchronous), Chief Procurement (synchronous) - MS.
People listen, write - different. Load refrigerators for meat - LS., CU., PNRM. Grocery store: bread department, packages of baby food - MS., PNRM. Dining room with his father Cyril Ulitin take food lunch - MS., LS. Greenhouses (outside) - LS., PNRM. Women gather cucumbers - MS., CU., PNRM. FV Khodakovsky with committee members in a greenhouse - MS.
Man digging potatoes in their area - LS. Ulitin with his son in a greenhouse - MS., LS. Hands dug germ - CU. Women buy greenhouse cucumbers, tomatoes, carry shopping - MS.
Siberian landscape - the mountains, the valley - LS. (Summer). Women work in areas - LS. Woman pouring milk - MS.
FV Khodakovsky talking with the builders of the road - MS., LS. ; Passes the airfield, with the members of the commission inspects newly constructed tunnels - different. The helicopter is part - MS. (Summer). Installation of high-voltage lines - LS. Power line from Ust-Ilim hydroelectric station - LS., PNRM. (Helicopter). Annual Meeting of Siberian scientists: posters: "The man in the BAM", "social issues", etc. - MS.
Are scientists, he says (synchronously) - MS.
Landscapes of Siberia - the taiga, mountains - LS. (Helicopter). Lake Baikal (autumn) - LS. Cave paintings - MS., CU. The house-museum of the Decembrists, the inscription: "Sergei Trubetskoi ... lived from 1844 to 1856» - LS., MS. Portrait Trubetskoi desk - MS., CU. Sergei kindles the fire, boiling water, the boy playing the accordion, and people in the van - LS. The building with the words "School of the Arts» - MS. (Spring). Said organizer Lyudmila Davydova (synchronous) - CU. Boy and graet accordion (synchronous) - MS., Hitting. Sit children, teachers - MS., LS. Boy playing guitar (synchronous) - MS.
Converse L. Davydov, the jury - LS., MS., PNRM. Celebration in honor of March 8: Men sing a comic song (synchronously) - LS. ; Listen to women - CU., LS., PNRM. Arts school, children run along the corridor - LS. Girls are choreographed under the teacher's guidance - MS., LS., PNRM. Painting class, children paint under the teacher's guidance - MS.
Festival of Guitar Song - LS., CU., PNRM. the hall. Singing boy-drilled (synchronous) - MS., CU. 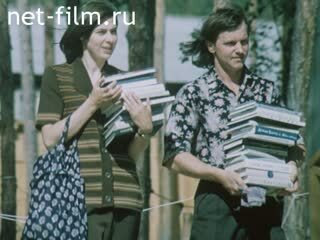 Sergei Davydov and Lyudmila at home - read, do the housework - different. Passing car, a road sign that says "Budzhekish» - LS. (Winter). Village people go - LS. The workers are in the tunnel - LS. 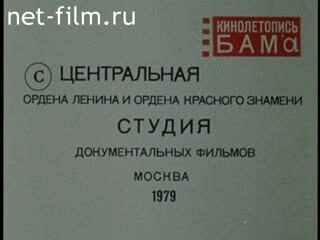 L. Davydov is a musical evening (synchronous) - MS., CU. VR Tolstoukhov, his son and daughter of the listeners - CU. Construction work in the tunnel - different. Train rides, the inscription "Tynda-Berkakit works on Communism» - MS. The meeting of the first train - LS., PNRM. Drive through various special machines - CU., LS. The helicopter is part - LS. (Helicopter), CU. The first train arrived in Severobaikalsk - LS., PNRM. Helicopter (winter). Lake Baikal - MS. (Autumn). Ulitin and son are on the shore of Lake Baikal, throw stones into the water - LS., Hitting.